Now that we are close to the new year eve in China it is a good time to write something about them. 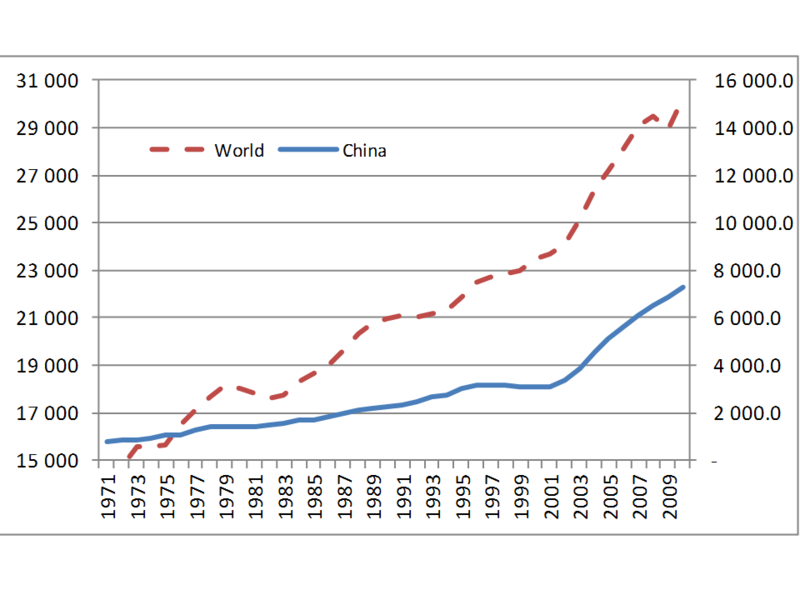 The figure in the beginning of the post displays how influential is China in the current emission path of the world. 25% of the emissions come from there, if the rest of the world would suddenly stop every emission China’s CO2 would be enough to be over the 20% maximum that is considered a reasonable equilibrium. Even more important than the share (lower than the population share) is the trend, whereas most developed countries are not increasing their emissions significantly lasts years Chinese CO2 is growing very fast. It is not the only one but it is the greatest and I think that the leader of the developing-developed countries group. In a previous posts I mentioned USA and China as keys. They are, all of us are to some extent. However, I think that China will fix the trend that many others will follow, because they can reverse the upwards emission path and fix the peak, after that the perspective will be different. And how is it doing in China? I am not an expert and see news of both sides. In one part, they are burning half of the coal of the world, if they do not stop we will get quite hot.In the other hand there are signs for hope as most Chinese are convinced of the importance of climate change, they want to be more active in renewables and form part of International Renewable Energy Agency (IRENA) and even if their 6 ton per capita emissions per year are not far from many European countries (but far from the USA), they burn them in part to produce goods that export. Transport emissions are low for example. They have the opportunity to lead the development of many renewable energy technologies. They have the opportunity to build many things in their society in a low-carbon way and this is much easier than transforming high carbon structures.